Iain Archer's 'We Can All Be Friends' can be heard as the beautiful musical backdrop to the latest Friends Reunited Ad. It features one guy going about his various daily activities, but with his friends joining him in all his pursuits - something which Iain has not experienced, but just so happens to have perfectly embellished. 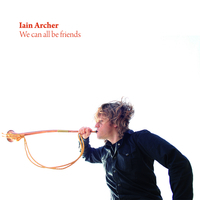 Unfortunately at this time we can't offer all the Iain Archer - We Can All Be Friends tracks as individual mp3s, as some of these tracks exceed the shops maximum (9mins) download length.